Clan MacHorn: The MacHorns are descended from King Hind-Horn of Suddene/Galoway and his Manx/Norse wife Rymenhild, daughter of King Ollaf of Manx (the same Olaf, as legend has it, found and wedded a Selkie woman whose decendents have webbed or "Lucken" toes and are sometimes known as "Sliocha nan Ron", The Children of the Seal.) The youngest son of King Horn, Dunstan, married Princess Penna of Fortriu (a pictish woman), and built the Manor of West Hall in her lands, which the MacHorns claim as their ancestral home. About 100 years ago the MacHorns lost thier lands to the Anglo-Norman family "De Leth", who still occupy the estate.The entire Clan was forced to become Nawkins (Travellers) in the Highlands and travel about seeking their fortunes doing intinerant work, thievery, and selling their warrior skills to the highest bidder. Presently the Family travels about in 3 main groups, and meet once a year in Garrioch lands, to renew bonds, gossip, trade, and pass the Clan history to the new generations. The largest branch is called the Heron Band, the next are the Cat Band, and the smallest is the Seal Band. 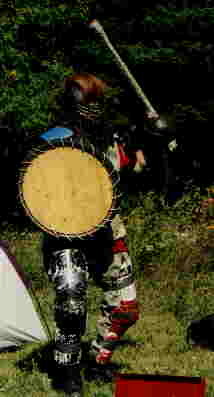 Allan's History: Allan is the 2nd son of Ian "Big John", Cheiftain of the Seal Band. He was raised upon the trails, paths and roads of the Highlands, and is proud to be called a Nawkin as well as a Highlander. 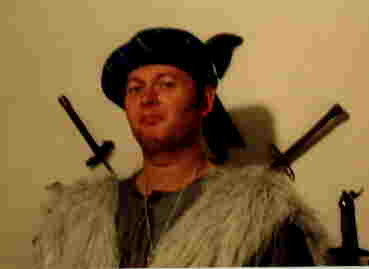 Like his entire family, Allan dabbles in intinerant work, thievery, and works as a "sell sword" when time permits. Also, like his clan, he dreams of the MacHorn's being able to give justice to the hated De Leth's (Leiths) someday... and maybe reclaim West-Hall again. The Clan, however, contents itself with petty strikes at the foe, and it was just such a "petty strike" that saw Allen's present stituation develop.His brother, Ian "the Younger" and himself raided a party of 7 De Leth's near the Parish of Oyne, killing them to a man and stealing a bag of gold, not knowing that the leader of those men was a 1st cousin to the "Lord Leth" himself. The bounty on the brother's heads made their lives extreamly percarious, and a detachment of the foe and their mercenary highlanders caused the brothers to separate and flee. Ian fled south to Lothia, while Allan hid in a hay-wagon bound for Aberdeen Port. Neither fled back to the clan for fear of retributions. In Aberdeen Allan realized the bounty was known of. He couldn't flee the walled and guarded city by land and couldn't stay there, and so he stowed away on a merchant ship. The ship sailed to the Port city of Dublin, Ireland, which was at the time under Anglo-Norman control, and so Allan left Dublin at night, and fled north (hoping to find a friendly port to return to Scotland). Instead he came accidently upon a Tinker's camp led by one Owain O'Rose, who decided to spare this lost Scot's life for a sizable portion of his 'stolen' gold. Owan had a brother who served aboard a merchant ship bound from the Port of Cork, and so "escorted" Allan to Ireland's far south.The ship where Owain's brother, Jonathan, served wa a privateer as well, but it's Captain was a British "snob" who's abusive ways to his "Dogs of Ireland" crew, caused him to be loathed. They soon mutineed at sea, being led by Jonathan O'Rose and his friend from distant Scotland... Allan. Jonathan set himself up as Captain with the acceptance of the mutineers, and made Allan his First Mate. Other members served various posts, and the ship continued to sail, but this time as a "freebooter". Life at sea appealed to Allan, for he could now return to Scotland anytime convienient, and -as well- exact satisfaction and vengence on the Anglo-Normans and particularly the 'De Leth's who's ships plied the Celtic sea in commerce. Allan's first time in armor. 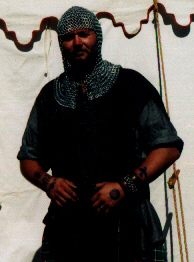 Allan in his recently aquired chainmail. In the Society Allan is a heavy fighter and reluctant Bard.